This is where the 500 - year long " Age of Angkor " began. Phnom Kulen is the mountain on which Jayavarman II initiated the royal 'god of the king' liga cult in 802AD, declaring a unified and independent Khmer Empire under a single ruler and beginning what would later become known as the Angkor period (though the capital city would not actually move to the Angkor area for another century.) Soon after the ceremony, Jayavarman II moved his capital from Phnom Kulen to the area near the modern town of Roluos (see the Roluos Group) where it was to remain for almost a century before moving to the Angkor area. There are several minor ruins at Phnom Kulen including hundreds of linga stands in the Siem Reap River. Waterfalls and active pagoda. It's abit over 50 km each way from Siem Reap so set aside at least a half day for the trip there and back. Regular admission ticket is not required. 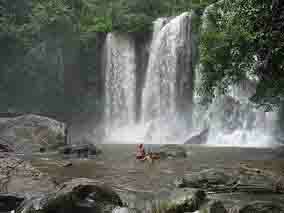 There is a separate entrance fee of $20 for Phnom Kulen.